Meet Michael Crawely, designer, photographer and art director of the cutting edge Australian sunglass brand, Valley Eyewear—a collection of dramatic, hand crafted eyewear that carries a bold personality. 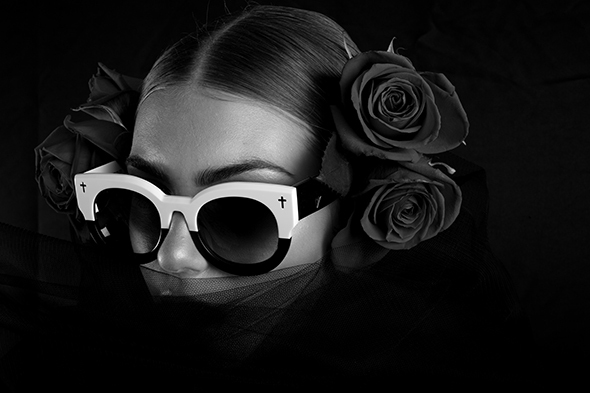 Valley Eyewear is the construction of a creative world with no boundaries, which represents a movement of a somewhat dark, fashion-forward cultural tribe. They are risk takers with forward- thinking personalities and eccentric taste who are not afraid to make a statement. Take for instance the influencers that have obtained customized eyewear such as Kat Von D, Chris Hemsworth and Kanye West. These epic frames come from a selection of vintage piles of acetates curated by MC during his travels. The strong and lightweight bio-plastic materials are then tattered and sampled to find deep colors and unique fades. Each pair of glasses takes twenty-five sets of hands to be completed and carries the lenses of Zeiss Optics; long time experts in the field. The designer has constructed a sharply polished and minimal assemblage of progressive techniques that offers an eclectic collection of eyewear strong enough to enhance styles and moods with a message that expresses individuality. The final result is a confidence-boosting construction inspired by architectural bulky angles that is perhaps not for everyone, but rather for design driven individuals. We wanted to hear more about this creative vision and got to chat with Crawely. When did you start the brand concept? I started valley eyewear around three years ago. I began drawing frames from scratch and wanted to create an eyewear line that reflected my passion for architecture, and the somewhat darker clean high fashion element of style that I was so drawn to. I shoot the photos on all our campaigns, art direct them and have done the eyewear so being across the whole project from start to finish ensures I get the look and feel for the brand that I’m portraying to the people. Can you tell us a little more about your collaborations with other artists? We brought together like-minded people into the mix. We work with closely with Jesse Draxler, the guys at ATTAK in the Netherlands and THEBLACKMATH in Melbourne. Lee Brennan designs have crafted a ring collection for us. Chelsea Wolfe also collaborated with her song on the film we made for the last campaign. And I’m working on a project with Rick Owen’s DJ “ Bryan black – Black Asteroid. We have all have similar love for music and darker edgy fashion. Where do the inspirations of your campaigns come from? The beauty of putting three twelve foot high prisms in the middle of amazing natural habitats has been a strong element for u. This time in the middle of a cracked dirt mud basin in the California desert. It has all the beauty of nature with the polar opposite black structure and the handcrafted frames. Those elements make it striking; a strong message that shows our brand is unique. The prism is part of our logo and what we call our collections, it is a symbol that represents our core concept: “A refraction of light, a direction to darkness”. A slightly obscure, high fashion fused with the natural simple and minimal elements of the earth. Any plans to design apparel? Absolutely, apart for the sunglasses we are already designing optical glasses and jewelry; it just feels like a natural thing to progress in other lines of products. We have talked to some really interesting people about potentially doing something next year.